Well, I made it to Lansing. It only took me about 45 minutes longer than it normally does. I left quite a bit earlier than I needed to….just in case. I got to Lansing about an hour before I needed to be there, so I went looking for lunch. 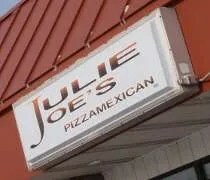 For quite some time, I’ve tried to stopping at Julie Joe’s on Jolly Road near the Dunkel Road intersection. It seems like every time I try, it’s closed. They close for three and a half hours between lunch and dinner during the week, they don’t open until five on Saturday, and they’re not open on Sunday. It seems like every time I’ve pulled into the small strip mall, it’s been one of those times. This time, I made it in time for lunch, so I knew they would be open. The previous business in this location was 2Fer’s. I never made it there before it was closed, so I have no idea how much has changed. Both on their website and on an insert in their carry-out menu, they make note of the fact that they used to be 2Fer’s. I have no idea what that means or why, but since they make a point to mention, I thought I should to. After spending the afternoon killing time before work, I was now faced with a longer than usual lunch break. Now, I had another couple hours to kill. Since I had just eaten an hour or so ago, a big lunch was out of the question. I wasn’t even really sure I wanted anything at all. I went to Barnes & Noble first to look for a couple things then I just started walking around downtown East Lansing. 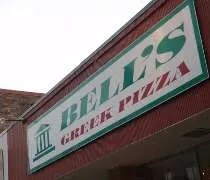 Didn’t really know where I was going, but when I ended up on M.A.C Avenue, I figured I could use a slice of pizza..
Bell’s Greek Pizza has two locations in East Lansing and they’re not very far apart. I’ve eaten at the Grand River Avenue location before, but never the location on M.A.C. Avenue near Albert Avenue. The downtown location is a small street front building. There are a handful of tables in the front of the space. The order area and kitchen is in the back. I’m a huge fan of pizza-by-the-slice locations. It’s one of my favorite things about college campuses. You can get just a couple slices for under five bucks. I love it. Another weekend on the road back in East Lansing for work. I was on my own for a hotel, so I was on the look out for the cheapest I could find. That’s not an easy task on a football weekend, but I was able to find one for under $50/night. It was the Motel 6 on Saginaw Highway. Not a five-star hotel by any stretch of the imagination..hell, lucky if it was one, but all I really needed was a bed for a few hours and it did serve that purpose and I’m sure I’ll be staying there a lot this winter. Before bed though, I needed food. There aren’t many places in Delta Township where J and I didn’t eat. That area of Lansing is one of the major shopping districts and we made trips out that way once a week. We almost never did pizza on that side of town though, so I pretty much had my pick. There was only one chain out there that wasn’t on the south side where we lived. Even though I read a so-so review a year or so ago, I decided to give it a shot. 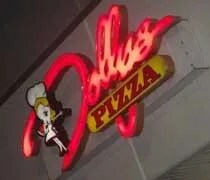 Dolly’s Pizza is a chain out of White Lake, Michigan and most of their stores are in the Detroit area. They were voted Best Pizza in Michigan at some point by the Michigan Restaurant Association yet they never say what year that was. Gumby's Pizza & Wings on Grand River Avenue in East Lansing. Long hot days. I haven’t had too many of them the summer, but I have had a lot in the last week or so. It seems at work picks up for me, our pleasant summer has taken a vacation. Saturday was no different. A ten hour day at Michigan State left me hot, tired, and hungry. I decided to act like a college kid and I put in an order for pizza. 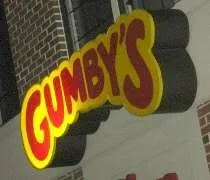 I don’t know why I thought of Gumby’s Pizza and Wings as I was trying to look up phone numbers using the web browser on my outdated Motorola Razr. I’ve heard of Gumby’s but I’ve never had a pizza from one. The chain is pretty exclusive to college campuses with 25 locations throughout the US. There is one other location in Michigan at WMU in Kalamazoo. Cottage Inn Pizza on Washington Square in downtown Lansing. Long baseball games make me hungry. I was at the Saturday night beating the Lugnuts took at the hands of the Dayton Dragons and by the time the game finally ended, I was craving pizza. J was at home and hadn’t eat yet either. She texted me to see what I was going to do and I told her to call for pizza. 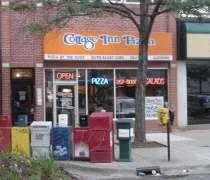 Cottage Inn has several locations in Lansing and the surrounding area. We usually order from the one in Holt because it’s closest to our place, but it was my turn to buy dinner. Had J ordered from Holt, she would have had to buy, so I told her to call the downtown location and I’d just pick it up on my way home. The Washington Square location sits near the corner of Washington Square and Washtenaw Street. It’s a small building, but they actually have a little bit of seating in the front of the store. They serve pizza by the slice and actually had some in the rotating glass case at 10:30 at night. I’ve always wondered about that when I drive by after baseball games. 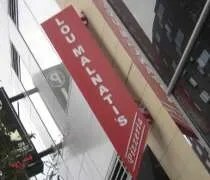 I guess it was Saturday night and they probably do a decent business from the bars with the slices. 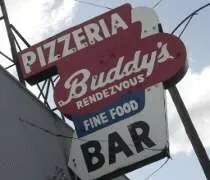 Buddy's Pizza on Conant Street in Detroit. Finally! This weekend finally got here. It’s a weekend that J and I have been looking forward to for quite a while. My family, including my 9 month old niece, was coming to see us. The purpose behind the trip was to take in a ballgame at Comerica Park. It was unfortunate that we couldn’t pick a weekend that the White Sox were in town, but my brother and sister-in-law already had vacations planned for this week and since the Tigers were home, we got tickets and planned on enjoying a long weekend in Michigan. Before we could go to the game, we had to find food. As I’ve mentioned on this blog before, pizza is the easiest thing for us all to agree on. Most people recommended Pizza Papalis in Greektown which, up until a few weeks ago, was the plan. As I was surfing the Chow.com boards, I kept reading about Buddy’s Pizza.